Jack is a Senior Associate at Touchdown Ventures, joining the team in 2017 and focusing on investments in the Internet of Things (IoT) and physical security sectors. 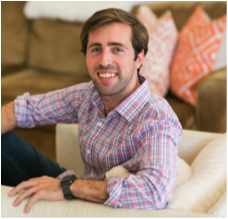 Before Touchdown, Jack gained operating experience at Personal Capital, a venture-backed startup in Silicon Valley, and was co-founder and President of the Philadelphia InSITE Fellowship chapter while attending business school. Prior to that, he spent time in the New York venture ecosystem evaluating investment opportunities at Laconia Capital Group, New York Angels, and Virgil Capital. Jack previously worked at the Royal Bank of Scotland where he specialized in short-term interest rate products. Jack holds a BA in History from Duke University and MBA from The Wharton School at the University of Pennsylvania, where he graduated with honors as an Entrepreneurial Management and Marketing & Operations major.